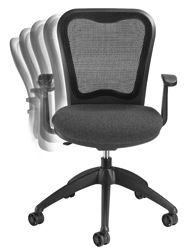 The MXO chair is designed for meeting rooms, break-out rooms and conference room settings. Overall dimensions of the chair: 25" wide, 24" deep, 35 1/2" - 40 1/2" high, seat height 16" - 21". WEIGHT CAPACITY 250 LBS.